The external storage market has exploded over the last few years with drives in nearly every shape and colour. So apart from their looks, what differentiates them? Network area storage (NAS) is the latest buzzword for external storage drives and it gives you the ability to connect to your drive over a network, wired and in some cases wireless. The LaCie Internet Space drive that I’m reviewing has this ability plus more. 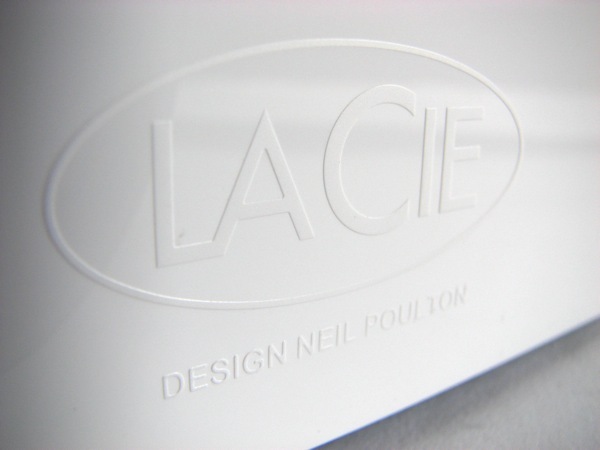 LaCie has always been known for its minimalist design, and the Internet Space is no different. When I first had a proper glance at it, it reminded me of a giant Lego block. 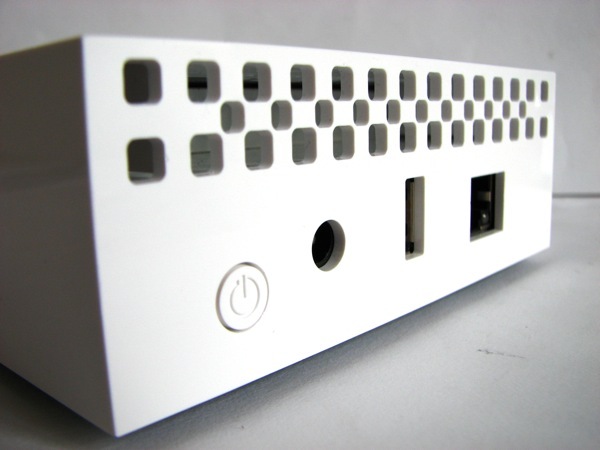 The whole design is just a white brick with no lights, logos or buttons on the face of it. The ports and power button are located at the back of the hard drive and a cleverly hidden blue LED light at the front shines on to the surface the drive sits on. Furthermore, the Internet Space leaves out a fan for ultra-quiet operation. The drive is named Internet Space because its bonus feature is the ability to transfer files over your home network or access the contents of it over the Internet. This makes the data on your drive truly accessible from anywhere in the world from a web browser. The Ethernet connector on the back allows you to hook the drive straight in to a router. My setup has been to connect it using Ethernet over Power whilst it sits in my bookcase, rather than having it take up space on my desk. This helps to de-clutter my desk and reduce the amount of background noise. 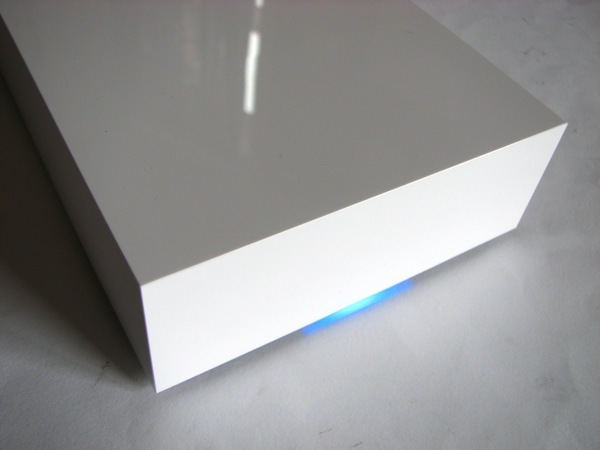 LaCie brings a new meaning to external storage and have made the Internet Space UPnP and DLNA compatible. Not heard of these acronyms before? UPnP standards for Universal Plug ‘n’ Play. It’s a feature that many of your home routers will be compatible with and essentially you to plug devices in to it and have it recognised and made accessible across your network without any configuration. This includes sharing other USB devices that are plugged in such as flash drives, cameras and printers. DLNA stands for Digital Living Network Alliance, is the standard used for consumer devices to share their digital content such as photos, music and videos. So if you’ve got any devices around the home with DLNA or UPnP certification, then it will happily tap in to the Internet Space and be able to play content from it. There’s also an iTunes streaming server built-in so you can keep your iTunes library on this drive and access it from anywhere in the house. It just pops up in your Shared list on the left-hand side whenever you load up iTunes. 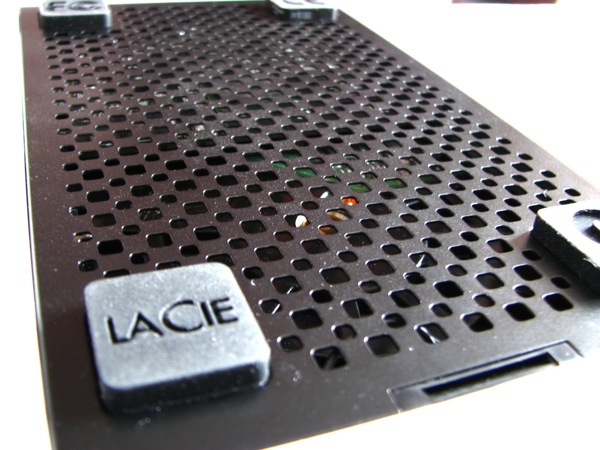 LaCie have also included the facility to create password-locked areas for storing data that is only accessible through your private login credentials. This makes it perfect for use in the home or in a small office where multiple users want to store their files on the drive but don’t necessarily want to make it available to anyone with access to the drive. An open access ‘family’ area is also available for opening up content. Another killer feature of the LaCie Internet Drive is the ability to access the contents of your drive over the Internet. Each drive comes with free access over the Internet to your drive through the www.homelacie.com portal. On initial setup of the Internet Drive, you create your security login details, which allow you to log on remotely. You get completely control and access over the drive. So never again do you have to worry about leaving files at home. This is one of the best features of the Internet Space and makes products such as Windows Home Server completely irrelevant. Another factor when deciding which hard drive to go for is connectivity. The LaCie Internet Space comes only with Ethernet access, so if you’re planning on connecting up to it via USB or Firewire, you’ll be sorely disappointed. This is perhaps the biggest limitation of the Internet Space drive. If you’ve got a huge amount of data for your initial transfer to go across, it’s going to take you some time to complete a full system backup for example. I’ve been using the Internet Space with an Ethernet over Power connection, and through that, I’m able to get 30Mbits/sec transfer rate. To put that figure in to perspective, it would take about 40 minutes to transfer 7GB of data. If you’re able to connect to the drive through a network switch, I was able to achieve 50Mbits/sec, which cut the transfer rate of the 7GB file to about 20 minutes. Whilst these are transfer speeds are nothing to balk at, they’re nowhere the speed that a local USB or Firewire connection can achieve. To put those numbers into perspective, using a Firewire 800 connection to transfer a 7GB file takes about 3 minutes to complete, double that for Firewire 400, and add a bit more for a USB 2.0 connection. If you’ve got the right setup for a Gigabit transfer then you’ll naturally experience a boost in speeds, but consumer-end Gigabit routers/switches and cables are rare and expensive, so do bear that in mind if you think you’re going to be able to rely on that. LaCie have come up with something quite special with the Internet Space Drive and it’s definitely a step up from the hundreds of models that are on the market today, that don’t offer anything new in terms of functionality. It’s definitely refreshing to see the Internet Space Drive with network storage at the heart of its purpose, and the execution of the whole setup is incredibly seamless and easy. Add to that the ability to use it as a streaming content server for services like iTunes, the ability to access your content over the Internet, and you’ve got the whole package right here. Whilst external hard drives have come crashing down in price over the last few months, this puts the Internet Space in a tricky spot because there is a premium to pay for these extra features. You can easily pick up a 500GB USB 2.0 hard drive for about £60, whereas the LaCie runs in about £120. It’s a similar story with the 1TB drives, with USB 2.0 models coming in at around £80, and the Internet Space at around £160. However, given the features you get access to with the Internet Space, it’s actually quite exceptionally good value when you consider that a Windows Home Server system will cost you at least £350 for equivalent storage. Also consider that a Windows Home Server system will consume more energy and more space, and the LaCie Internet Space starts to look like a much more attractive option. I’m looking at the HP Home Server that runs on Windows Home Server, but this drive looks like it gives you the same functionality. Are there any other must-have functions that the HP Home Server will offer that this doesn’t? Thanks for the review. This looks like an interesting product. But as you pointed out, there’s no USB or Firewire transfer. First backup might take 24 hours but that’s not a problem if you just leave it running in the background I guess. Like how it’s got an iTunes server built-in. Cool! I never really understood what NAS drives were all about. Sounds ideal for my family rather than have them stealing my Western Digital all the time. How difficult is it to setup if I want to use this drive on several machines on wired/wireless connections? This looks like its great for those who want to share content or have access to their files remotely. Not that badly priced when compared to other NAS drives which seem to be aimed at small businesses or enterprise level storage. They should have included a USB port for transferring files at least. Shame that’s it missing, otherwise seems like a great product. @SME: There isn’t an auto-power off function, but you can logon remotely and shut it down – but of course you can’t then switch it back on remotely if you then need access to the drive. During testing, I had this drive switched on whenever I was awake, then at the end of the day I’d shut it down. Is auto-standby a feature you’ve see in other NAS drives? Well, what I want is a NAS that turns the harddrive off when not being used for some minutes – not the entire NAS. I don’t know if that is just standard on NAS drives. I only have experience with one NAS – a Qnap something – and it does power down the harddrive if desired. When the NAS is accessed the harddrive spins up again and after a few seconds the files are available. (Just like my PC when I don’t use it for half an hour (+/-) ). That is what i am searching for… But I find the Qnap too expensive and with too many features that I’m not going to use. @SME: I’ve used NAS drives from Freecom, Buffalo and most recently the LaCie, and I don’t recall any of them having any auto-power down features. I’m not aware of any other drives that do have this feature. Western Digital do a line of ‘green’ drives so might be worth taking a look at what they have available in NAS and power-saving products.